It is only through a scholion of John of Scythopolis that Crispus’ vision in the eight letter of Dionysius Areopagites can be traced back to an episode of Damascius’ life. This shows that the exegete was an aware accomplice in the forgery. Secrecy and venerableness were peculiarities of Areopagus’ judges. Damascius’ aim was to give a posterity to his own philosophy dressing it with Christian clothes into a contemptous fake. For the first time, we offer the edition of a latin hexameter considered by the specialists as apocryphal of Eugenius of Toledo: first hexameter of Appendix’s poem 26, In baculo. The text has been found in an inscription from Aiguafreda (Catalonia), which can be dated in the VIIth century by its archaeological context. We connect the archaeological, paleographic and epigraphic data in order to propose a renewed point of view of a text whom nature has been only known through manuscripts written some centuries after the so called spurious autor’s death. Sedulius Scottus’s Collectaneum Miscellaneum has preserved the contents table of a lost manuscript (here called Σ) transmitting a set of Augustinian works, for some very rare (c. Secundin. and c. Gaud.). This manuscript directly served Sedulius, who extracted numerous passages from a dozen different treatises for his Collectaneum Miscellaneum and his Collectaneum in Apostolum. The study of these excerpts, the confrontation of the text they witness with the data of the direct tradition of the works and the analysis of the content of another lost manuscript, the MS. † Chartres, BM, 104 (101), linked to the collection Σ, make it possible to trace the circulation of this collection in the ninth century, to establish relationships with traditions from Liégeois and Auxerrois regions and thus to propose new hypotheses on the biography of Sedulius Scottus and the places that he frequented. The first known Latin commentaries on the Rhetorica ad Herennium, arose between the late 11th and the early 12th century, represent a relevant part of the so-called “renaissance” of that time, when the handbook started to become a real classic, specifically essential for the study of the colores rhetorici. A survey in this field seems to be particularly necessary, for almost all these glosses are hitherto unpublished and thus lacking a proper comparison; and the first step is to be seen in this paper, which provides the critical edition of the glosses of master Menegaldus (“master of the modern masters”: probably the first of the new, original readers of this age), kept by some fragments now in Munich and only recently identified. They will be compared with other significant unpublished glosses: especially those produced by Odalric of Rheims and by the still anonymous glosses of the MS. Trier, Bistumsarchiv, Nr. 18. William, a Benedictine monk of Malmesbury, Wiltshire, England (died ca. 1142), was one of the best-read men of his time. His writings (which include two major histories of England, lives of two English saints, a commentary on the Book of Lamentations, and a collection of miracles of the Virgin Mary) deploy a vast array of words, some highly unusual, and many employed in unusual ways. This article lists a representative selection, discussing where William found them and what he made them mean. It paints the picture of an author in love with the art of writing Latin, ever experimenting in metaphor and seeking out new and vivid ways to make his style more striking, a master of sensuous and vigorous expression. reservation, then a place to build civical memory and finally a symbol of that very memory, the use of which allowed the connection to an ancient tradition. Some polemical annotations in MS Par. gr. 3 by Nicolaos Nectarios Abbot of Casole are here edited and commented. They address the Jews, the Latin Church, and the exegesis of ancient ecclesiastical authors. There is evidence to suggest that they date to the last years of the Abbot’s life (1233-1235). The Galician-Portuguese Cantigas of Santa María dedicated to the life and miracles of the Virgin include various references to saints of Catholic tradition. Although some may perform a main role in the wonders, a large number of them are only mentioned as an external presence. The latter could be defined as ‘non-protagonists saints’ and they are evoked by the poet in several contexts related to a variety of functions. In terms of content they may be summoned to recall biblical episodes linked to the main Marian narratives, to enrich the narration of Mary’s Holy Feasts and episodes of Jesu’s life, to build references to the four evangelists and so on. As for a rhetorical and metrical function, saints may be mentioned using always a fixed formula at the end of verses employed by the poet to oath about the veracity of the miracula or in exclamations spoken out by characters of the stories to call to witness a saint to ensure the genuineness of their actions. 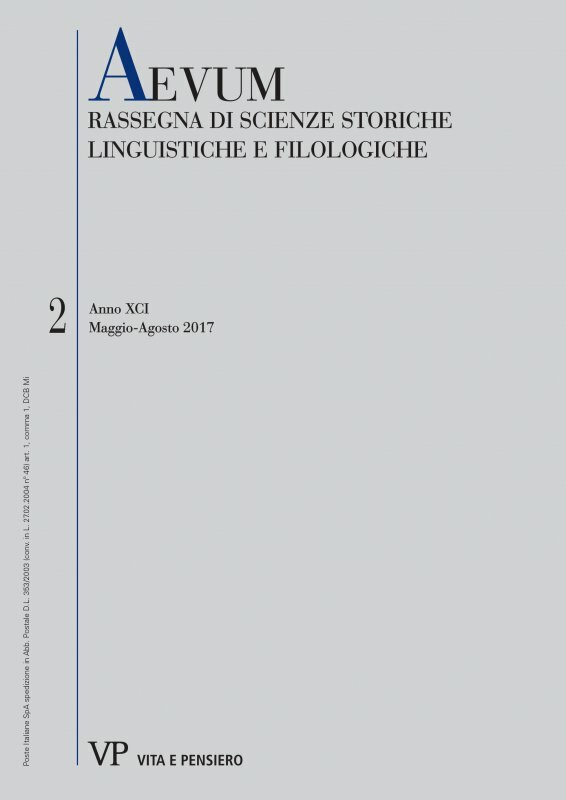 This article investigates the political essay De statu et mutatione Romani imperii written between 1323 and 1324 by Landolfo Colonna. After the examination of the text’s sources, the connection between Landolfo’s treatise and the one that Marsilius of Padua wrote to mock him is considered. Furthermore, this study presents the 13 manuscripts containing the De statu, two of which are newly discovered, and also its trasmission and circulation, both in manuscript and print. Supported by his private library, by the remarkable one of Chartres Cathedral and by his knowledge in canon law, Landolfo professed his loyalty to pope John XXII describing the Empire’s translations in order to demonstrate the illegittimacy of Louis the Bavarian’s claims. This paper shows some annotations of the Florentine notary and poet Domenico Silvestri (1335 ca.-1411 ca.) in a famous Boccaccio’s autograph, MS. Zibaldone Magliabechiano (Firenze, Bibl. Nazionale Centrale, Banco Rari, 50), a large miscellany written in ‘mercantesca’ around 1355. Silvestri was looking for information about geographical subjects, in order to elaborate his important encyclopedia De insulis, an alphabetical catalog of all the islands in the world. In particular he read and put some notabilia on Boccaccio’s De Canaria, describing Canary Islands. Silvestri also annotated some extracts of the Chronologia magna of Paulinus Venetus (1270-1344 ca. ), quoting this work in the De insulis. This paper presents an edition and a study of the mediaeval Catalan translation of Liber specialis gratiae, which is preserved in the manuscript d-IV-19 in the Real Biblioteca del Monasterio de San Lorenzo de El Escorial, and unknown until now. In fact, it actually consists of two small compilations of different length, contents and probably authorship, each of which focuses on certain aspects of the book by Mechtild of Hackeborn. It is difficult to know whether the two selections were made from a complete Catalan translation or whether the texts were translated from Latin. Regardless of the model followed, they represent the first Iberian translation of the Liber specialis gratiae, a few decades before the Latin edition sponsored by Cisneros.